With a history that began in 1989, the Mazda MX-5 is one of the hottest-selling convertibles on the market. In its 21 years of history, the MX-5 saw three different generations, numerous design updates, and even more engine changes. However, the most impressive upgrade has been announced for the fourth-generation that debuted on September 3rd, 2014. The Mazda MX-5 remains a rear-wheel-drive, compact sports roadster with an exterior design inspired by the Shinari Concept unveiled in 2010. With the new generation, the ND, Mazda focused on reducing the total weight to less than 2,400 pounds and implementing the SkyActiv technology that’s already available across the rest of its lineup. Slightly shorter and lighter than its predecessor, the new Miata also received a new exterior design, which makes it unique among other Mazda nameplates despite featuring various cues from the company’s current KODO language. Updated 03/25/2016: The new Mazda MX-5 was named 2016 World Car and World Car Design of the Year at the 2016 New York Auto Show. Masahiro Moro, the President and CEO of Mazda North America said it was a "Wonderful Honor" when receiving both awards for the company. 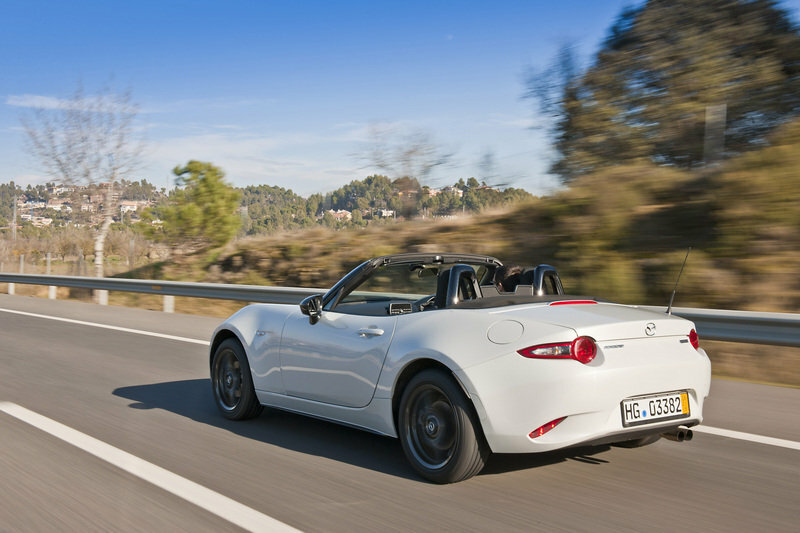 Continue reading to learn more about the fourth generation Mazda MX-5. Although the body of the new MX-5 is also made in steel, it features high-strength panels and some ingenious structural solutions, such as a twin-backbone frame, to solve the problem of open-top rigidity. One of the most unmistakable characteristics attributed to the previous generation of the MX-5 Miata is the large grille that it looks like it was on a perpetual caffeine fix. The fourth-generation MX-5 did away with that in favor of a more basic grille that’s similar to what we saw on the original Miata. 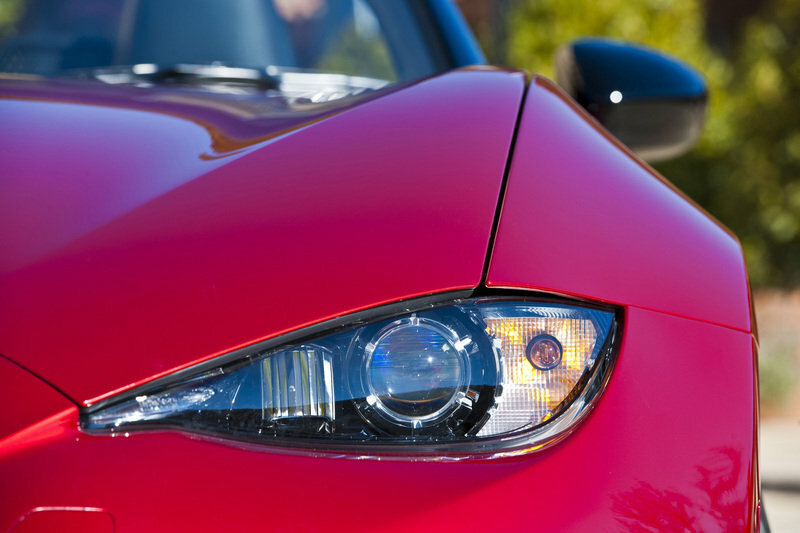 The headlights of the MX-5 were also given a makeover where they now carry a distinct up-slanting teardrop shape with LED lighting technology. Upon closer inspection, you’ll notice that the new lighting configuration is also pretty similar to the original’s setup. 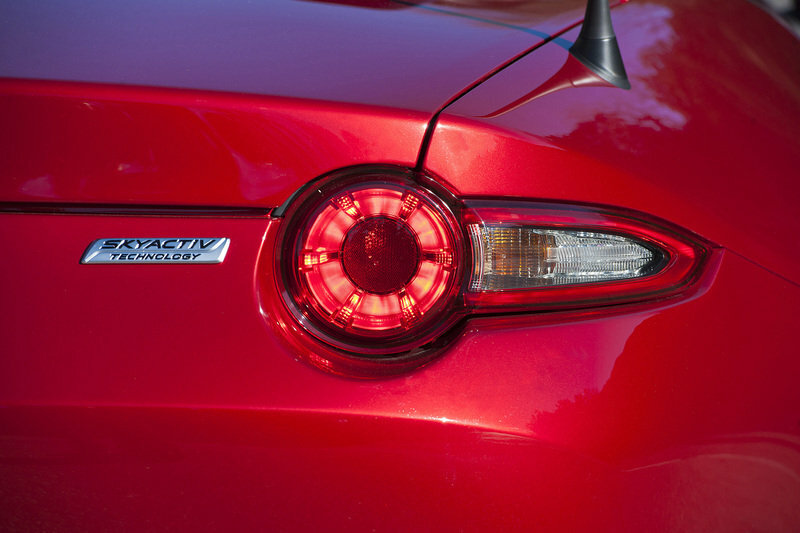 For the rear fascia, Mazda ditched the Miata’s classic layout in favor of a unique design that features a tall bumper and a pointy trunklid spoiler. The fascia is otherwise crisp and clean with rounded taillights and sharp turn signals extending into the bumper at each side. The MX-5’s new profile is sleeker and sportier than before. The sloping hood and the muscular fenders give it a GT-like appearance that’s difficult to obtain on a compact sports car such as the Miata. More importantly, the fourth-gen MX-5 is lighter than its predecessor, tipping the scales at 2,332 pounds with the manual transmission and at 2,381 pounds with the automatic gearbox. The manual version is 115 pounds lighter than the previous car, which is excellent news given the new 2.0-liter engine is less powerful. Although it doesn't feel roomier than its predecessor, the new interior does offer a lower seating position. If you happened to like the previous Miata’s spartan and purposeful interior, then you’ll definitely love the ND’s layout, as Mazda has kept dashboard’s configuration mostly untouched. Sure, the shiny plastic insert running the entire length of the instrument panel has been ditched for a soft-touch piece, but the round A/C vents and the circular knobs are still there. The center stack, on the other hand, is significantly cleaner, as most of the buttons and switches are replaced by a modern touchscreen. Mazda retained the three-spoke layout of the steering wheel — a trademark for the Miata — and kept the center console similar. On the flip side, the door panels were redesigned from the ground up, as they now incorporate body-colored panels at the top for a more premium look. Although it doesn’t feel roomier than its predecessor, the new interior does offer a lower seating position. This, combined with the more supportive seats and the lower hood, gives the Miata a racier feel from behind the wheel, a feat roadster lovers will appreciate. Although initial rumors mentioned anything from 1.3-liter to 2.0-liter four-cylinder engines, the new Miata actually received a SkyActiv, 2.0-liter, four-cylinder gasoline powerplant here in the United States. Identical in size and number of cylinders to the SkyActiv engines found in the Mazda3, Mazda6, and CX-5 models, but specifically tuned for the Miata, the four-banger sends 155 horsepower and 148 pound-feet of torque to the roadster’s wheels. The horsepower rating is identical to the Mazda3’s, while torque sits only two pound-feet lower. Also, the Miata’s mill delivers its power and torque at 7,000 and 4,800 rpm, respectively, while the Mazda3’s 2.0 does it at 6,000 and 4,000 rpm. The four-pot mates to either a six-speed manual transmission or a six-speed automatic gearbox, but it’s yet unclear whether these units feature bespoke setups from the MX-5. In Japan, the Miata received a 1.5-liter, four-cylinder engine that produces 129 horsepower and 110 pound-feet of torque, significantly less than the U.S.-spec roadster. A six-speed manual is the only transmission choice. 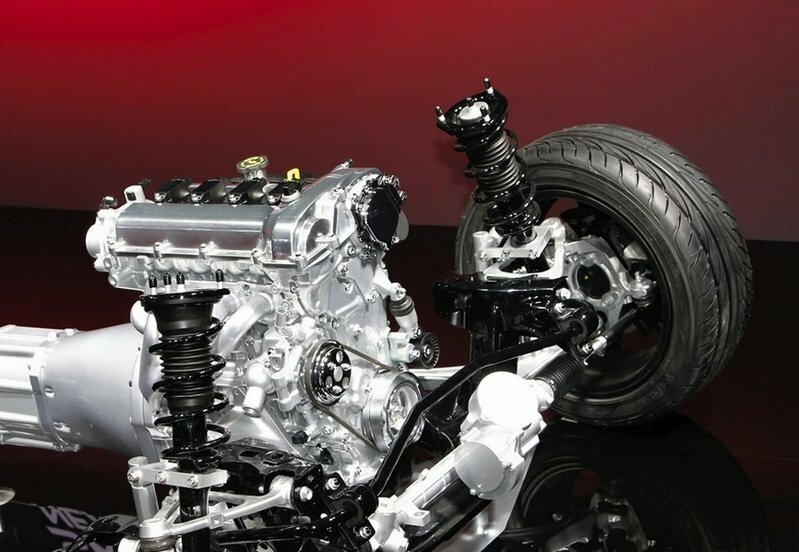 The chassis that Mazda displayed at the 2014 NYIAS showed a front mid-ship, rear-wheel-drive layout, with the engine pushed closer to the middle of the vehicle. 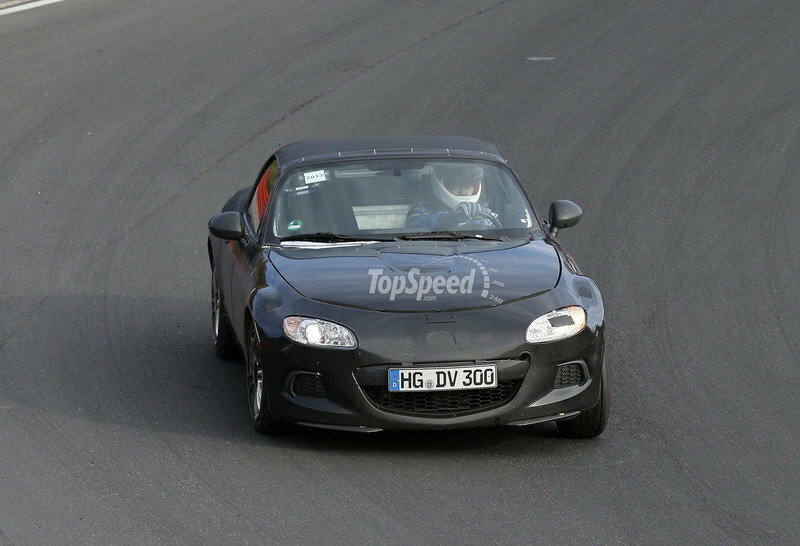 This is the first time that Mazda will use this front mid-ship setup in a rear-wheel-drive, SkyActiv setup. 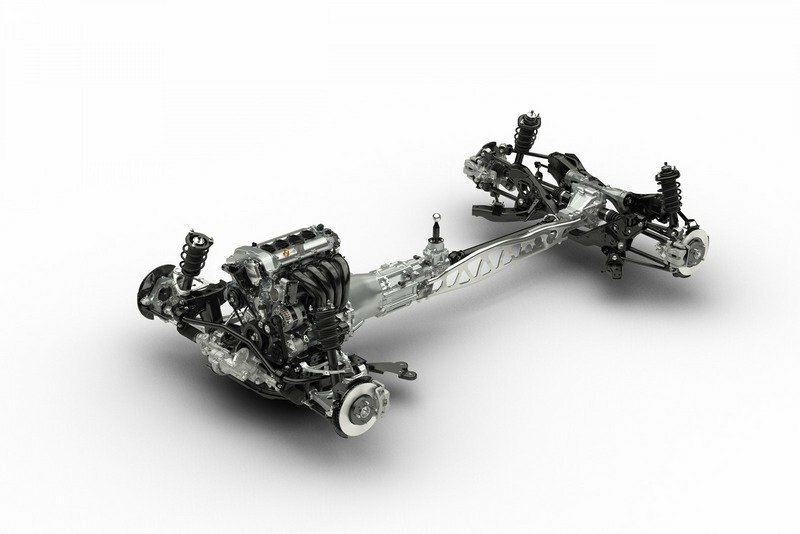 In true SkyActiv fashion, the chassis features tons of aluminum, which helped push the MX-5’s weight down, while maintaining rigidity and safety. Along with the weight savings, the new MX-5’s footprint is also closer to the first-gen Miata’s, and the center of gravity is lower than any MX-5. This isn’t Mazda’s first award from the World Car Awards program. 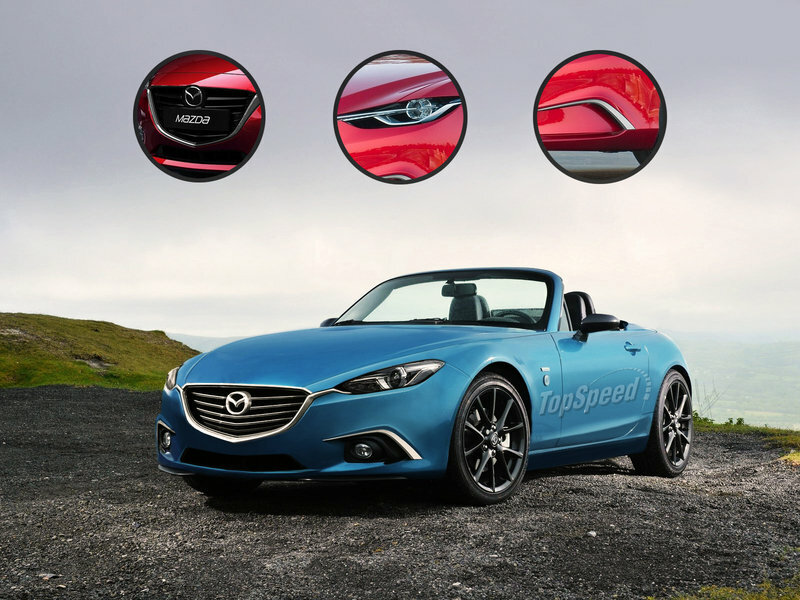 The new MX-5 joins the 2013 Mazda6, 2014 Mazda3, and 2008 Mazda2/Mazda Demio, which have all earned “Top Three in the World” status. The 2008 Mazda2/Mazda Demio was also named World Car of the Year back in 2008. The first 1,000 examples of the 2016 Mazda MX-5 will all be Launch Edition models. In addition to the limited production, all of these cars will come in an exclusive grouping of a Soul Red exterior paint job with a Sport Tan leather interior. The only option available to Launch Edition buyers is the choice between a six-speed manual or automatic transmission. After the Launch Edition, the 2016 Mazda MX-5 Miata lineup will consist of three trim levels starting with the Sport. Even though it’s the base trim, the 2016 Mazda MX-5 Miata Sport still offers plenty of standard features including LED headlights and taillights, Bluetooth phone and audio streaming, cruise control, power locks, a leather-wrapped shifter and a USB port. Options for the Miata Sport are limited to the $1,075 automatic transmission and a $130 keyless entry system for manual-transmission cars only. The middle of the 2016 Mazda MX-5 Miata lineup is the Club trim level, which upgrades to 17-inch alloy wheels with a dark gunmetal finish, Mazda Connect infotainment system with a seven-inch touch screen and Bose audio system, piano black seat loops and door mirrors, an air dam under the front fascia and a rear spoiler. Miata Club models with the manual gearbox also receive improved handling thanks to a front shock tower brace, Bilstein shocks and a limited slip differential. For even better styling and performance, there is a yet-to-be-named $3,400 package that brings Brembo front brakes with painted calipers, 17-inch BBS forged wheels and aero improvements added to the rocker panels and rear fascia. Once the Launch Edition is exhausted, the top-of-the-line model will be the 2016 Mazda MX-5 Miata Grand Touring. This trim goes all out with leather seats, automatic climate control, bright 17-inch alloy wheels, rain sensing wipers, adaptive headlights and Mazda’s i-ACTIVSENSE. This suite of safety technologies includes lane-departure warning, blind spot monitoring and rear cross-traffic alert. Yet another driver’s car coming from Japan, the 370Z is known for its excellent handling, a rev-matching manual transmission, and powerful V-6 engine. Only one engine is currently available, a 3.7-liter V-6 rated at 332 horsepower and 270 pound-feet of torque. 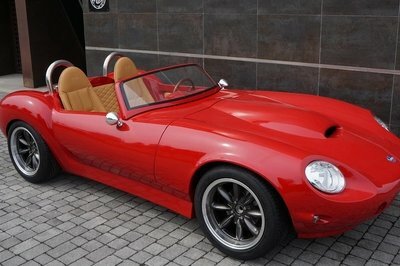 The oomph pushes the roadster from 0 to 60 mph in 5.5 seconds and up to a top speed of 155 mph. The only downside of the 370Z is that it is significantly heavier than the Miata at 3,232 pound, and that’s not likely to change until the second-generation model arrives. 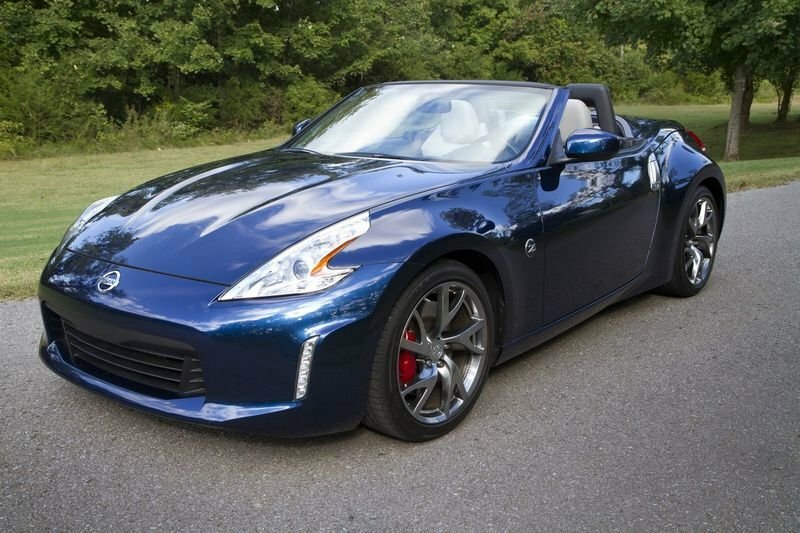 Pricing for the 2015 model year 370Z Roaster starts from $41,820, about $17,000 more than the current Miata. Ouch! Check out the full review here. An oddball in Mini’s lineup, the Roadster tosses the rear seats in favor of more trunk space and a reduced overall weight. It uses the exact same platform from the Cooper, but the Roadster is lighter than its siblings, tipping the scales at only 2,635 pounds. It’s still heavier than the new MX-5, but it boasts more cargo space than the Japanese drop-top, and a slightly superior power-to-weight ratio when selected in its Cooper S trim. 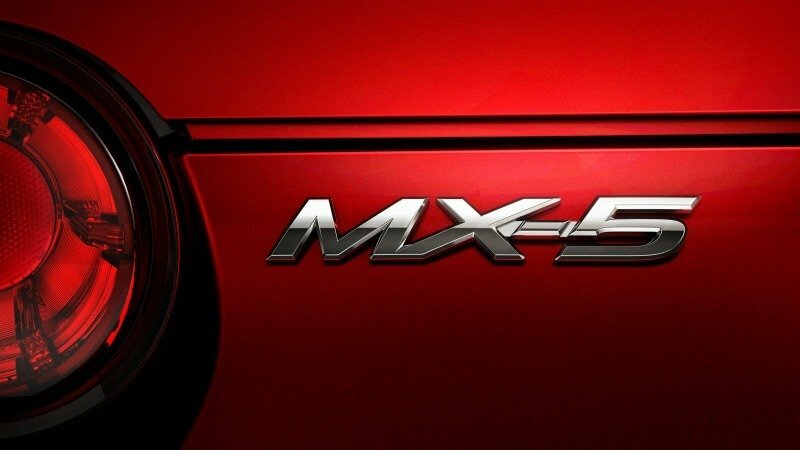 While the base model and its 121 horses is a little slow for the Miata, an "S" badge will put the Roadster right up the Mazda’s alley. 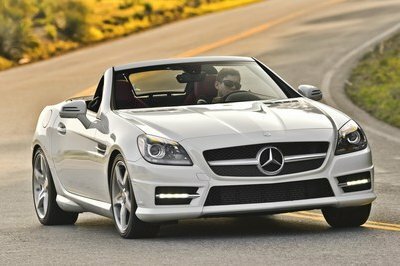 The mid-range model comes with 181 horsepower and 177 pound-feet of torque on tap, which translates into a 0-to-60-mph sprint of 6.7 seconds and a top speed of 141 mph. More power comes from the JCW version, which gets 208 horsepower and 207 pound-feet that slash the 0-to-60 mph benchmark to only 6.3 seconds. The Mini Roadster starts from $26,100, but the S trim fetches at least $29,100. Lastly, the JCW version wears a $36,250 sticker. Obviously too expensive for the Miata, the Roadster is also on its way out from the market, as Mini doesn’t plan to develop a successor to the current model. 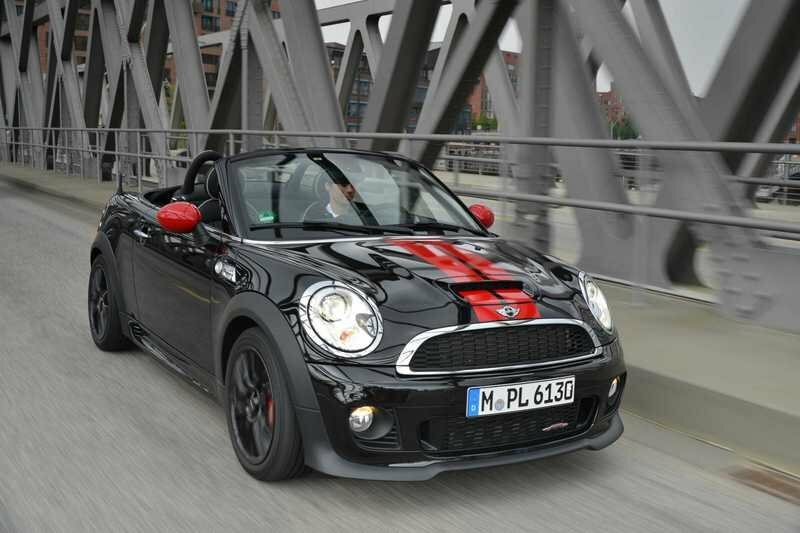 Read more about the Mini Roadster in our full review here. The BRZ/FR-S twins may come with a fixed, metal top, but they’re the perfect competitors for the MX-5 Miata in terms of performance and pricing. Both the Subaru and the Scion, which weigh in at around 2,700 pounds, are powered by a 2.0-liter, four-cylinder boxer engine that makes 200 horsepower and 151 pound-feet of torque. 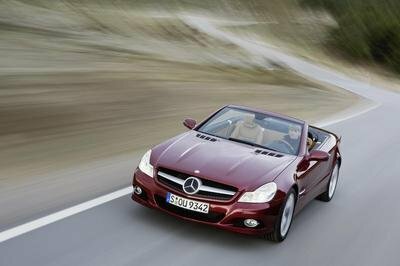 The unit mates to either a six-speed manual or a six-speed automatic and send power to the rear wheels. The Subaru BRZ can charge from 0 to 60 mph in as quick as 6.7 seconds with a manual gearbox, but the benchmark falls into seven-second territory with an automatic. 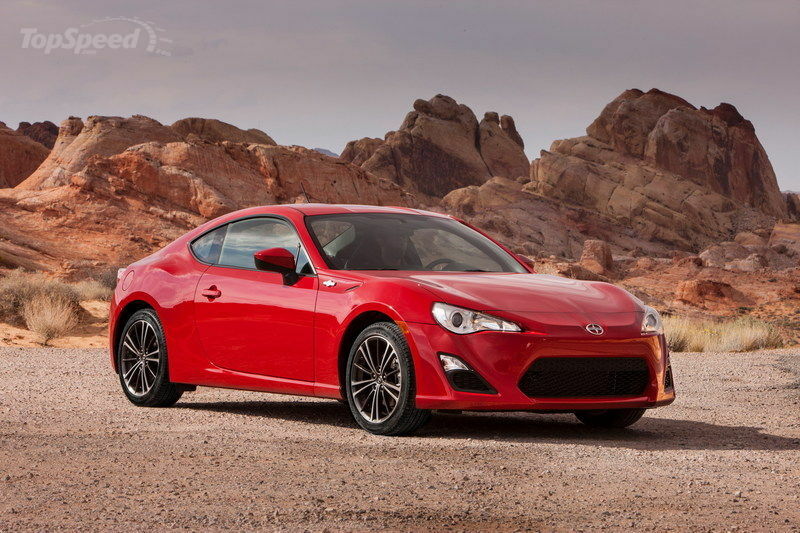 The BRZ costs from $26,490 including delivery for the 2015 model year, while the Scion FR-S Scion FR-S retails from $24,900 with a manual. Find out more about them here and here. 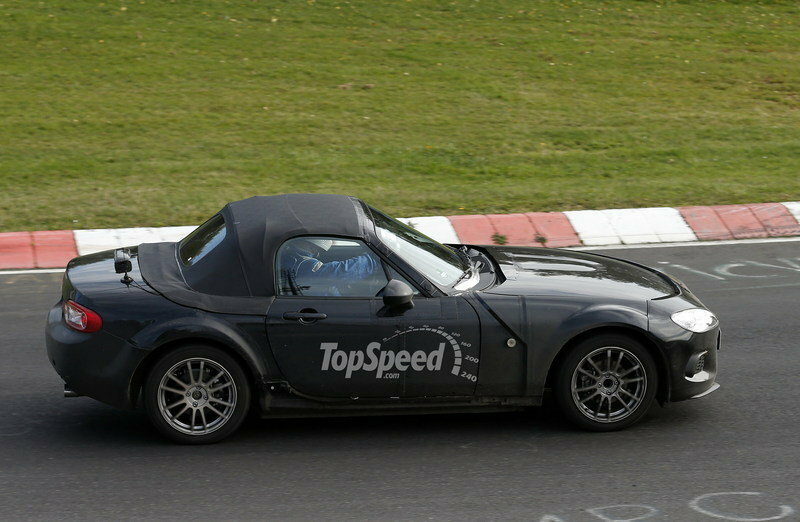 Needless to say, being fun to drive remains the new MX-5’s primary objective. Anything else would’ve made it disappointing to Miata enthusiasts, but Mazda made sure the fourth-gen roadster delivers what it knows best. Being lighter and using SkyActiv technology also means the new Miata is more fuel-efficient than before, while the new underpinnings likely make it the sportiest MX-5 do date. 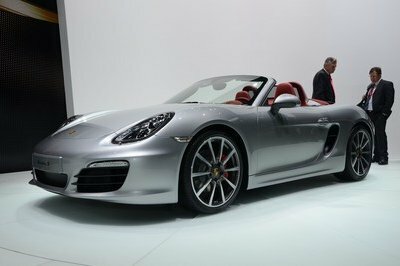 Lastly, the fresh design brings the roadster into the 21st century after a decade of only mild updates. While the fact that it’s less powerful than its predecessor might not be that bad with the new weight-saving techniques, the new technology and manufacturing features could increase its base price beyond expectations. Updated 04/20/2015: Mazda announced that the North America-bound 2016 MX-5 it is now in production. The company also confirmed prices for the entire MX-5 lineup. Updated 03/30/2015: Mazda officially confirmed that the all-new MX-5 will be put on sale later in the summer at a starting price of $24,915 in entry-level Sport trim. Full pricing list and options will be revealed at a later date. Updated 4/17/2014: The 2016 MX-5’s chassis and engine debuted at the 2014 New York International Auto Show, and its lightweight construction will help drop 220 pounds from the MX-5’s weight. 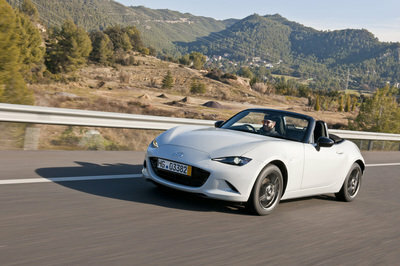 Updated 07/03/2014: Mazda officially announced today that the fourth-generation MX-5 will be unveiled on September 3rd and 4th, 2014 in Barcelona, Japan and the U.S. Updated 07/07/2014: We created a rendering for the future MX-5 Miata. 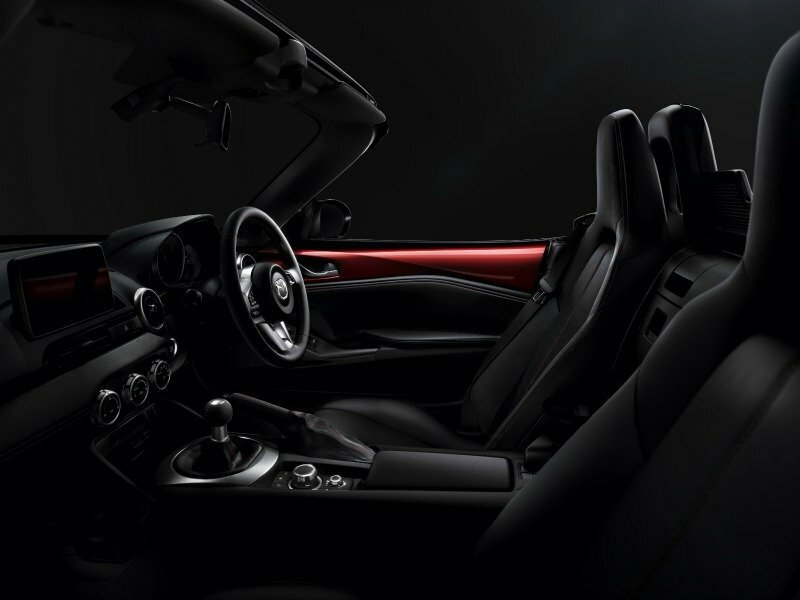 Updated 08/11/2014: Mazda unveiled the first teaser image of the next MX-5 Miata before the car’s official debut on September 3. According to the first details offered by Mazda, the next MX-5 will "look nothing like" the current generation and will adopt an evolution of the current Kodo design language. Updated 09/03/2014: Mazda has finally unveiled the fourth-generation MX-5 Miata. Its new design still stays true to the original, but has a look all its own. Mazda was very stingy on the mechanical details, but did spill some important info. 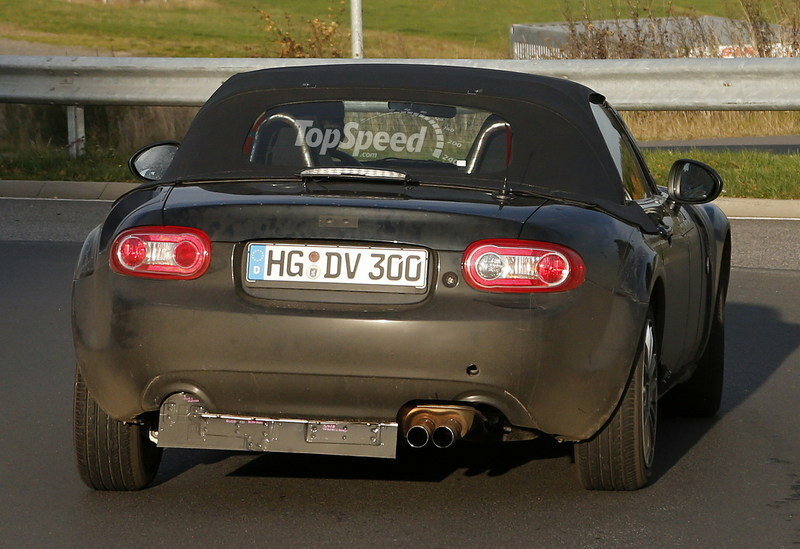 Updated 10/28/2014: Mazda has revealed a few details on the U.S.-bound MX-5’s powerplant, rated at 155 horsepower. Updated 01/30/2015: Mazda unveiled tons of new high res images and new driving footage for the new MX-5. Also, the company confirmed that on the Japanese market the MX-5 will deliver a total of 129 horsepower and 110 pound-feet of torque. On top of these official confirmations is a possible leak from the Chicago Auto Show’s Website that lists the U.S.-spec MX-5’s output at 155 horsepower — the leak has since been taken down. Mazda has since said that number is not accurate and it does not know where that number came from (AutoBlog). 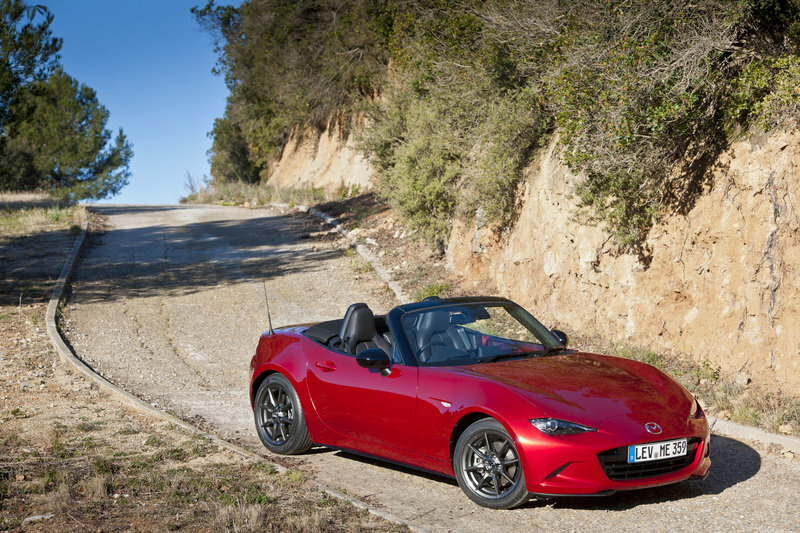 Updated 12/08/2015: The new Mazda MX-5 was named 2015-2016 Car of the Year Japan. Masamichi Kogai, President and CEO of Mazda said at the event: "Inspired by this win, we will continue building cars that offer driving pleasure, aiming to become a ’one-and-only’ for our customers that they will choose again and again." The wait is almost over, as North America-bound 2016 Mazda MX-5 Miata production began today, signaling the imminent arrival of the next generation of the world’s most popular two-seat roadster at U.S. dealers. Additionally, Mazda North American Operations (MNAO) has released pricing for the entire MX-5 range, including the first 1,000 cars earmarked as Launch Edition models. "The three trim levels available – Sport, Club and Grand Touring – are tailored for three very different types of customers, broadening the MX-5’s appeal," said Rod McLaughlin, MX-5 vehicle line manager, MNAO. "Whether customers opt for a Sport, Club, Grand Touring or Launch Edition, we’re confident the new MX-5 will deliver the same owner passion, excitement and pride that have made the previous generations among the most beloved cars on the road or racetrack at any price point." 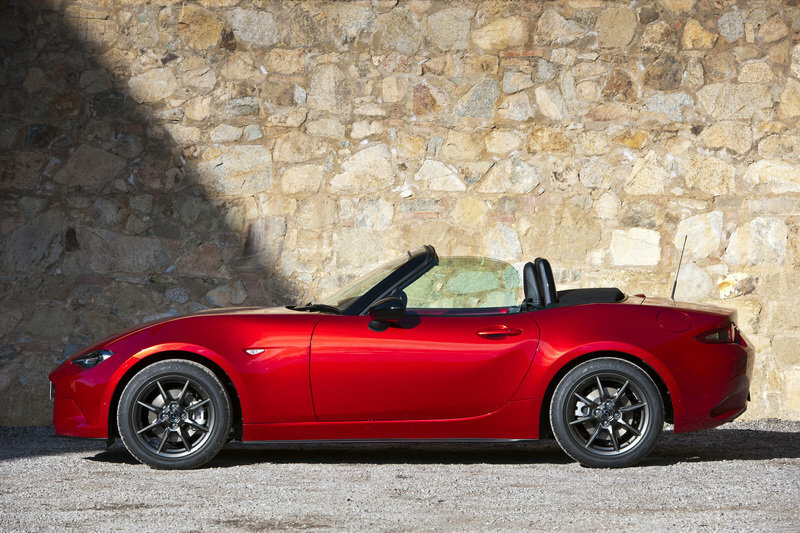 The 2016 MX-5 Launch Edition will comprise the first 1,000 fourth-generation roadsters sold in the U.S., carrying unique badging and with an MSRP of $30,495. MX-5 Launch Edition comes equipped with features reserved for the MX-5 Grand Touring trim, in addition to Advanced Keyless entry, which is optional in other trim levels. All 1,000 Launch Editions are painted Soul Red with a Sport Tan leather interior – a combination exclusive to the Launch Edition for 2016. To purchase an MX-5 Launch Edition, customers can currently preregister at www.LongLiveTheRoadster.com and will receive a reminder email prior to orders opening on May 5. Customers will then have the opportunity to place a $500 deposit toward the purchase of a 2016 MX-5 Launch Edition, also providing them the opportunity to select a dealership from where they can take delivery. MX-5s are expected arrive in dealers starting late summer. The Launch Edition’s sole option will be the choice of a six-speed SKYACTIV-MT manual transmission or the six-speed automatic, the latter of which carries an MSRP of $31,570. Customers who take delivery of an MX-5 Launch Edition also will receive a Mazda-branded BOSE® SoundLink® Mini Bluetooth® speaker in a customized gift box, along with select items from Mazda’s upcoming Heritage Collection apparel line. At the opposite end of the MX-5 lineup, the 2016 MX-5 Sport has a starting MSRP of $24,915, riding on 16-inch alloy wheels and carrying a host of new standard features such as a six-speed SKYACTIV-MT manual transmission, cruise control, LED headlights and tail lights, Bluetooth phone pairing and audio streaming, leather-wrapped shift knob, power door locks, single USB input and cruise control. As in the Launch Edition and all models, an automatic transmission option is available as a $1,075 option. Advanced Keyless entry is available for $130 (standard with automatic transmission). Those who want to step up to a higher level of content will have a choice between distinct trim packages: the distilled, performance-focused MX-5 Club or MX-5 Grand Touring, lavished in premium amenities and technology. MX-5 Club has a starting MSRP of $28,600 and adds 17-inch gunmetal alloy wheels wrapped in 205/45R17 tires, front air dam and trunk-mounted rear lip spoiler, piano black seat back bars and exterior mirror caps, MAZDA CONNECTTM with a seven-inch touchscreen infotainment system and commander control knob and an AM/FM/HD/SiriusXM® satellite radio with a nine-speaker BOSE® audio system with headrest speakers – all in addition to MX-5 Sport’s standard equipment. A limited-slip rear differential, Bilstein® shocks and shock-tower brace are standard when equipped with the manual transmission. Additionally, MX-5 Club is available with a package for $3,400 that equips it with forged, lightweight BBS 17-inch wheels, Brembo® front brake rotors and calipers with painted front and rear calipers, functional aerodynamic side sill extensions and rear bumper skirt. Moving to MX-5 Grand Touring endows the roadster with 17-inch bright alloy wheels, leather-trimmed heated seats, automatic climate control, BOSE® nine-speaker audio system with headrest speakers, AM/FM/HD/SiriusXM® radio, MAZDA CONNECTTM with and seven-inch touchscreen monitor, commander control knob, Homelink® garage door opener, rain-sensing wipers and adaptive headlights in addition to MX-5 Sport’s standard equipment. Mazda’s i-ACTIVSENSE suite of safety features including blind spot monitoring, rear cross-traffic alert and lane-departure warning. MX-5 Grand Touring has an MSRP of $30,065. Smaller, lighter and more focused, the 2016 MX-5 is purpose-built with one goal in mind: providing the thrills and wind-in-the-hair driving experience that only the MX-5 can deliver. At 2,332 lbs. when equipped with SKYACTIV-MT (2,381 lbs. with the automatic transmission), MX-5 is approximately 150 lbs. lighter than the vehicle it replaces as a result of Mazda’s efficient SKYACTIV® TECHNOLOGY. MX-5’s lighter weight, enhanced technologies and greater performance should help ensure that the 26th year of the MX-5 will be just as exciting from behind the wheel as the first 25 have been.